Just about everyone seems to love coins, but unfortunately not every collector knows how to love them. I’m talking about the 4 things people shouldn’t do with their collectible coins. The mistakes are usually made by new coin collectors who have little to no numismatic knowledge but mean well. As you may have already guessed, I’m not just talking about cleaning coins — though, I’m about to address that. I’m also going to cover a reason not to buy coins, and why you should keep chemicals and soldering guns away from your numismatic collectibles. It’s a mistake that I venture to say just about every new coin collector makes. I certainly did, and I know a lot of other professionals with far more experience than I who did the same thing when they first entered the hobby. But let me help you prevent making the same error I did. Don’t clean any coin, period. It might be tempting to dip your “dirty, brown” Lincoln pennies into a vinegar and baking soda dip, and I’ve heard from numerous inexperienced collectors who want to “shine up” their old silver dollars. Cleaning a coin will cut its value by 50% or more. It also damages the coin by removing its natural toning and a thin layer of metal. The damage to a cleaned coin is effectively irreversible. Seasoned coin collectors will tell you (and so will I) that a coin is preferred in its natural, aged state. Come to think of it, there are relatively few collectibles for which a cleaning may actually enhance their value. Classic and antique cars come to mind. Coins, on the other hand, should be left just as they are. Artsy types like to turn ordinary, everyday items — such as coins — into jewelry and other art. While I’m all for the arts, I’m not one to suggest turning a coin into a piece of art. Why not? Because just about anything you need to do to a coin to incorporate it into art or, say, a piece of jewelry will all but assure its destruction. Glue, soldering guns, paint, and coins don’t get along well in the numismatic sense — let me just put it that way! I’ve seen so many coins numismatically ruined by artistic intentions. Of course, the artist might counter me and say, “But it’s now a beautiful piece of art!” Perhaps, yes. But, so, too, is the coin in its original shape! I can’t stop (and won’t stop) anyone from turning their own coin into a piece of art, and more power to you if your artistic eye is crafty enough to turn coins, clothespins, paperclips, or whatever else is laying around your house into a fancy masterpiece (God knows I’m certainly not that artistically talented). But for the love of all that glitters, I hope that you’ll at least consider using only common coins for your artistic endeavors. Not too long after I got involved with answering coin questions here at The Fun Times Guide, I realized a lot of people were asking about silver pennies not from 1943. Of course, the 1943 steel cents contain not one gram of silver. Nor do most of the other “silver” pennies that people were asking me about. The experiment may be a fun way to learn about chemical reactions, but the people who find these coins in circulation down the line will think they have just struck it rich. Oh, how I loathe telling people their silver pennies and gold pennies are chemically altered and essentially worthless. If you’re going to learn about chemical reactions using common pennies, that is your prerogative. But please don’t spend these altered coins, lest you break hearts later on! Buy coins for fun, buy coins as gifts, but by all means, don’t buy ever buy them as investments alone. 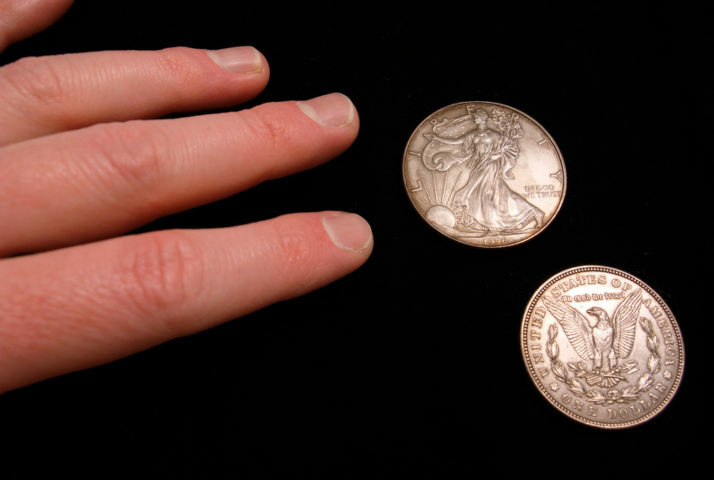 While many who buy coins do so purely for the love of numismatics, I know there are more than a few in the hobby who imagine themselves becoming rich overnight because they stocked a few hundred bucks away into silver dollars. Buying coins only for their investment potential is the very worst reason to buy collectible coins. There are many many people who have earned money through investing in coins, but there are also many many who have lost huge sums of money this way. Anybody who remembers the coin market crash of 1989 will tell you not to buy a coin as an investment alone. The same goes for bullion. Investing in bullion is great, but only if you’re up for gambling with money. Indeed, all investing is really just glorified, white-collar gambling. Nothing more, nothing less. And don’t listen to those who tell you that gold will hit $5,000 or silver is supposed to hit $100 someday, and by all means don’t throw your life savings into investing in bullion. Nobody knows what gold and silver will be worth later today, tomorrow, next week, or next year — let alone 20 years from now. The volatility of world markets makes it impossible to really know what silver and gold bullion will be worth at any point down the line. In the same way, collectible coins are also prone to market swings. Many of the valuable coins that experts told coin collectors to buy 10 or 20 years ago are actually worth far less today because the bad economy caused many people to sell off their coin collections. Meanwhile, many who once sought old coins are now buying modern coins instead — pushing values down on some old rare coins. My point? Buy coins because you like them, not because you think they’re going to help you retire early or put the kids through college. If coins afford you to make a huge profit on them down the line, then that’s just icing on the numismatic cake!